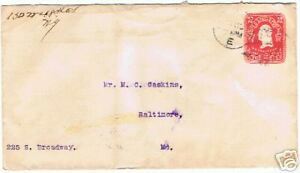 1906 METROPOLITAN STAMP CO., NYC H/S Corner Card to Montague City MA, SC #U396! BALTIMORE, MD. REC'D MAR 11 4 30-AM 1905. NICE CLEAN LETTTER, WRINKLED ARROUND THE EDGES. IF AFTER YOU RECIEVE YOUR ITEM, AND YOU DON'T FEEL IT'S WHAT YOU WANTED, EVEN IF YOU FIND YOU JUST DON'T WANT IT FOR ANY REASON.